REVITALISING DUO SERUM is a new generation serum, a bi-phase liquid serum treatment, rich in nourishing and hydrating agents, formulated with a patented-pending, innovative encapsulation technology by Galénic that traps the oily phase within the moisturising phase during agitation, creating a fluid and homogeneous dispersion without any greasiness during application. 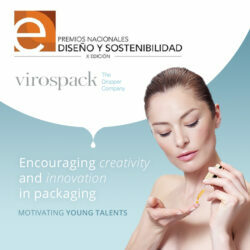 Both phases are presented in a FULL PACK by VIROSPACK. 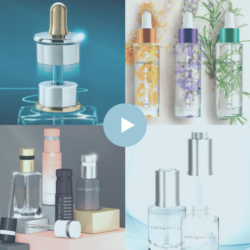 The presentation is composed of a high quality 30ml MOULDED GLASS BOTTLE with high transparency and an AUTOFILL DROPPER for precise and safe application. A high-tech push button dropper, the innovative and unique actuation system is patented by Virospack, ensuring serum intake with each click and an airtight closure. It is the first autofill dropper on the market with a bulb, offering a precise system for dosage and application and a pleasant usage experience. The Galénic dispenser pack was fully developed, manufactured, and decorated by Virospack. The high quality pack, carefully following Galénic’s brief, includes a clear bottle to showcase the bi-phase formula, decorated with black and white screen-printing and a black plastic autofill dropper. The result is a functional and precise final set with the cosmeceutical image of the range, developed using Virospack’s standard products and totally customized for complete integration into the Galénic Confort Suprême range. REVITALISING DUO SERUM by GALÉNIC is the ideal product for all women looking for cocooning skin care as well as an application that is precise, easy, comfortable, and clean; any time, any place; habitually or when require; thanks to the high-quality, portable format in a VIROSPACK´s PACK.